Punahou tailback Dalton Hilliard dove for the goal line but came up short yesterday against Iolani. Hilliard scored three TDs. 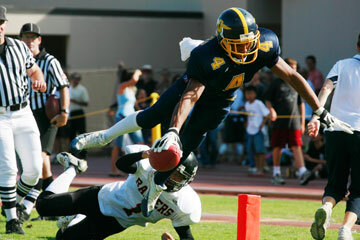 Punahou came just yards short of a state championship last season while relying almost exclusively on the passing game. Enter sophomore tailback Dalton Hilliard, who may just be the last ingredient the second-ranked Buffanblu need to finally get over the hump. Hilliard ran for 120 yards and three touchdowns, including a 56-yard score on his first touch of the game, as the Buffanblu came back from last week's narrow defeat against Saint Louis to crush No. 9 Iolani 52-25 yesterday at Alexander Field. Brett Kan added 301 yards passing and two touchdowns, both going to senior Miah Ostrowski, who caught eight balls for 128 yards, as the Buffanblu (5-1, 2-1) manhandled an overmatched Raiders defense. "Anytime you beat Iolani it's a good thing, because they never quit, which they showed tonight," Punahou coach Kale Ane said. "We knew they'd play us tough and they throw the ball up and take chances, but fortunately our offense came through." The Buffanblu wasted little time putting points on the board as Hilliard took their second offensive play of the game 56 yards for a quick 7-0 lead. "The hole was there and what happens is the linebacker is usually free on that play," Hilliard said. "I had to make him miss, and once I did, I hit the cutback lane and nobody was on the back side." Hilliard's lone mistake of the game, a fumble on the Punahou 19-yard line, gave Iolani great field position, and tailback Justin Yamamoto made them pay, scoring from 7 yards out with less than a minute left in the first quarter to tie the game at 7. After a 24-yard field goal by Kody Adams put the Raiders up 3, it was all Punahou, as Kan began to find his rhythm and the defense started forcing turnovers. The senior quarterback completed three straight passes to River Kim before Manti Teo scored from 4 yards out to put the Buffanblu up 14-10. Iolani quarterback Ryan Dung was then intercepted on the next two drives, and Ostrowski's 36-yard touchdown reception with 1:30 left pushed the Buffanblu to a 23-10 halftime lead. "Every time you get the running game going, it opens up things deeper in the passing game," Kan said. "I've got four receivers I wouldn't trade for anyone and they all played well." Punahou led 39-10 heading into the final quarter when the Raiders (3-2-1, 1-1-1) made one last charge. Reid Furukawa hauled in an 8-yard touchdown pass from Dung and Iolani converted the 2-point conversion to make the game 39-18. Then, after a perfectly executed onside kick that Iolani recovered, Ronnie Hirokawa took a reverse 15 yards for a score, pulling Iolani within 14. The Buffanblu recovered the next onside kick and Hilliard capped a seven play, 56-yard drive with his third touchdown run of the game to put it away. "He's got tremendous speed," Ane said of Hilliard. "His vision allows him to see the hole, hit it, and just go. We haven't had anyone like that here in a while." Truman Chun ran for 112 yards on 10 carries and the Warriors took out the Monarchs. Kamehameha posted the first four scores of the game and Damien never recovered.